Bike lighting is usually a pretty pedestrian affair: a handlebar-mounted headlight and possibly a seat-mounted rear flasher to make the bike visible to motorists. Palo Alto startup Revolights wants to change that. Their new product, which has just reached three times the level of requested funding on Kickstarter, is a set of LEDs mounted on the wheels of your bike–white in front for a headlight and red in back like a brake light. 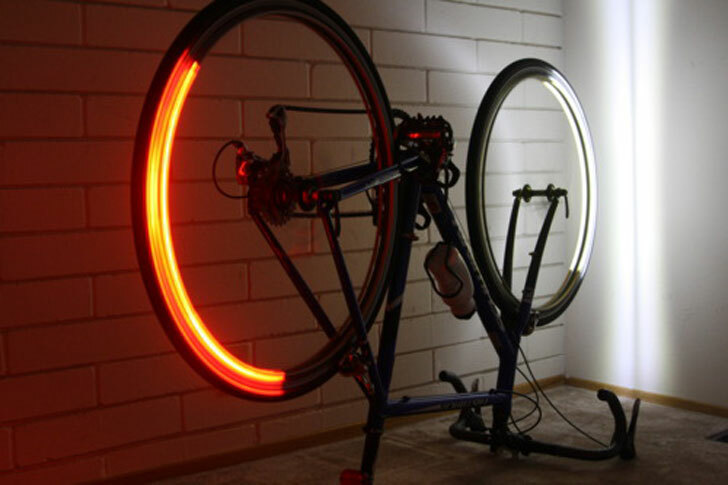 The cool thing about these lights, besides the fact that they are made with eco-friendly LEDs and make your bike look like a glow-stick, is that they provide illumination on the sides of the bike as well as at the front and back. The white light shows the way forward and alerts motorists of the location of your front bike wheel. The red back light does the same, orienting the location and distance of your bike for motorists–at least once they know what they’re looking at. Revolights is currently seeking another round of funding to take them through their fifth and possibly sixth prototypes before moving to manufacturing, but it would appear they are fairly close and that Kickstarter members are on board with them. Check out the Revolights Kickstarter project page and blog for a video of the bike lights in action and more details on where Revolights is headed. Bike lighting is usually a pretty pedestrian affair: a handlebar-mounted headlight and possibly a seat-mounted rear flasher to make the bike visible to motorists. Palo Alto startup Revolights wants to change that. Their new product, which has just reached three times the level of requested funding on Kickstarter, is a set of LEDs mounted on the wheels of your bike--white in front for a headlight and red in back like a brake light. The cool thing about these lights, besides the fact that they are made with eco-friendly LEDs and make your bike look like a glow-stick, is that they provide illumination on the sides of the bike as well as at the front and back. 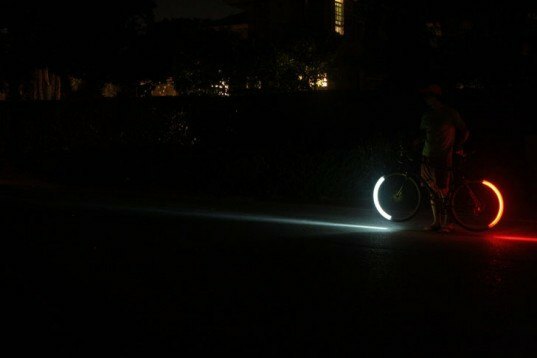 The white light shows the way forward and alerts motorists of the location of your front bike wheel. The red back light does the same, orienting the location and distance of your bike for motorists--at least once they know what they're looking at.